People often speak about CCTV surveillance as a relatively simple thing. In a sense, installing a control room and cameras is seen as a one size fits all process. However, there are many aspects to surveillance which impact on the infrastructure, control room design, monitor configuration, controls, and people and training that are needed for delivering performance. The sites or areas, situations, targets, camera profiles, and information usage will all impact on the type of surveillance done. The types of crime and manner in which they are carried out will define what needs to be looked for, and the type of camera would also change how things should be displayed. The use of thermal cameras introduces additional complexity in some aspects. Even the range of a camera can impact on what is displayed and needs to be identified on monitors. In some cases, video analytics may be used effectively, while in others it may produce excessive false alarms and detract from effective performance. I’ve highlighted a few surveillance types below to highlight how what is being viewed can influence the workstation design and types of equipment being used. Presence relates to whether a particular object or person exists in a place where it shouldn’t be. This is usually related to time, but can also involve types of areas. Camera patrols is one aspect of this where the operator switches camera on one screen, or systematically views a set of screens for any presence. In CCTV traffic monitoring, congestion and illegal use of roadways is relatively clear and violations are easy to spot. A car in a bus lane, for example, is difficult to miss if you are monitoring the screens and they have been laid out effectively. Use of blank screen technology where motion detection is used and screens are activated is another example of this. Viewing and classification of presence issues is relatively simple and the size of the camera image displayed can be relatively small. The detection of movement or positioning becomes slightly more complex than mere presence. For example, movement of people towards a fence line rather than along it. Also, stopping of movement at particular points which are known risk areas. People waiting near high risk or vulnerable areas where subsequent actions may be directed at such areas. People moving in a pattern which indicates that they may be looking at a way through or over a perimeter area rather than moving past in a conventional way. Times of day have a big implication in this respect, and use of thermal or infrared cameras for detection at night or use of conventional cameras in lit up areas are common applications. Video analytics for such activities needs to be relatively complex. It is not just movement detection, but directional movement, or even lack of movement from people staying still in a particular area. In many of these cases, having larger camera images on large screens or having dedicated monitors are necessary. Some anticipation and interpretation are necessary in viewing such behaviour, and early detection can allow a prediction of what is to come. General behaviour of people such as movement in a plant, on a street, access points for estates, or shopping area that is useful in that deviations from more obvious behaviour highlight that something is going on. Problem situations characterised by bunching of people, delays in processing of vehicles, obvious movement away from threats, and blatant crime situations like armed robberies stand out in this scenario. Similarly, where timing is changed, or speed of movement is different, such incidents can be detected. Screen displays should be of a sufficient size to observe general behaviour, although it needs to be considered that predication of crime behaviour is sometimes difficult when observing general behaviour. Behaviour linked to a particular type of crime, for example shoplifting, or theft of gold bearing material, usually requires some closer viewing of people. This requires a view of the person and surroundings in order to observe the behaviour and put it in context. The general body language of an individual needs to be observed in this context. The screen display size should allow for this. The surveillance approach in the City of Cape Town provides a good example of this where a spotter in the control room identifies potentially suspicious activity in an area, and then hands this off to an operator who then views the suspect more closely on a dedicated monitor. Crime characterised by small and subtle behaviours in a working place or town centre environment requires close up monitoring of people and a sensitivity to small and subtle body language. Something like diamond theft, street exchanges of drugs, pick pocketing, food and beverage theft, and some shoplifting examples fall into this category. There is a need to check hand movement and placement, quick movements and interactions, and specific body clues. Usually, full monitor viewing of suspects is required for detection in these kinds of conditions. Extended viewing of particular suspects requires tracking of people and their activities, interactions, work and personal habits over extended periods. This usually requires dedicated monitors, or in some cases, the use of grouped camera views in order to track people between areas seamlessly. Use of large screens with a set of clearly viewable camera views is the ideal for these. The ability to use PTZ cameras is also an element of this. Reviewing of video either takes place when auditing previous surveillance footage, or specifically looking at an event or behaviours that have been identified for closer inspection, or when an incident has been identified. Investigations personnel would also use this approach to examine footage. Dedicated camera views, if necessary on large screens, need to provide clear views of areas and body language. As in profiling, it may also mean that groups of camera views can be used on a large screen. Given that there is a combination of both crime and subtle crime behaviour being looked at, there should be the possibility of clear views of individual behaviour, including subtle behaviour cues. 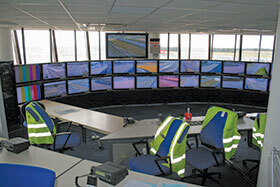 Control room and workstation design should therefore be fit for purpose. It is important to clarify exactly what kinds of surveillance you are wanting to do, and you may have several different workstations within the same control room with different functions. The nature of the layout, screens, access to features can all have a significant effect on the success of the type of surveillance work being performed.